When Matt Hanson had to pick brewing teams for Spokane Craft Beer Week, he took a decidedly old approach to this new event. He dropped the names of 12 of the region's breweries into a hat and created some unlikely duos, who have now gone on to create inspired and unique beers. The collaboration brews all will be unveiled during the inaugural Spokane Craft Beer Week, a series of events taking place across the region aimed to celebrate the local brewing industry. At restaurants and breweries throughout the region, you'll also find brewer's dinners, brewery tours, chances to chat with the beer makers and plenty of other drinking and educational opportunities along the way. But the collaborations are the most tangible (or perhaps most tasteable) way to capture the spirits of the brewing community. "I've been to a lot of beer weeks and I haven't seen this many collaborations," says Hanson, who is in the process of opening a yet-to-be-named brewery and tasting room in Spokane and volunteered to spearhead this first-ever event. The idea is simple: put two breweries together and see what they come up with. For River City Brewing's brewer Todd Grove, teaming up with Big Barn Brewing Company felt a lot like his days as a musician, when he'd jam with different artists. "I think it's art. That's how I come at brewing: a blend of art and science," says Grove, who worked alongside River City brewmaster Moose Sanders and Big Barn's Craig Deitz and Brad Paulson on the project. 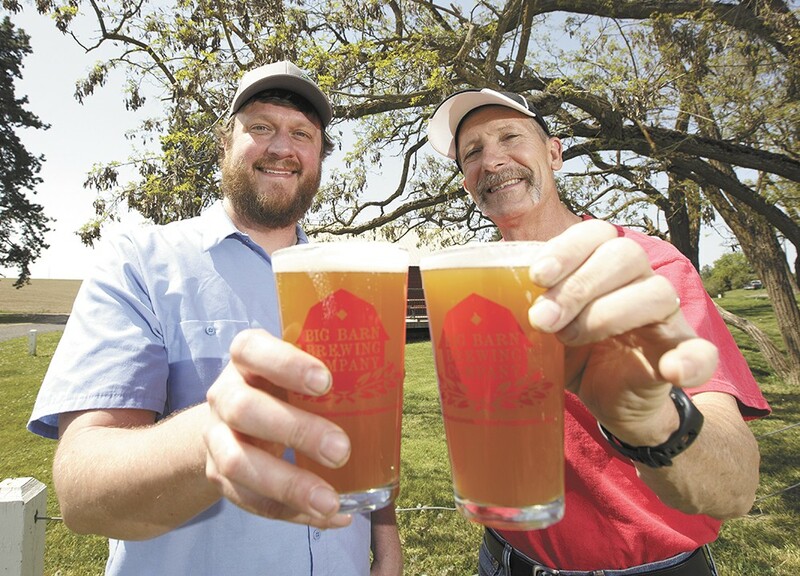 The two breweries converged at Big Barn's bucolic Green Bluff facility, where they went to work on a creation they eventually dubbed Barn City Flower Power, a session IPA (6.6 percent ABV) made with Amarillo and Cascade hops and flavored with culinary lavender grown on a nearby farm. "It's a standout brew. Both [Sanders] and I agree that it has an incredible nose on it," says Deitz, who credited River City's yeast and the knowledge of Sanders, who learned his brewing techniques in Germany, for some of the beer's uniqueness. The city-meets-country collaboration was a nice change of pace, says Grove — who typically works his days in the ultra-urban River City space — and also a chance to bounce ideas off the Big Barn folks. "The other thing is that brewing is labor-intensive, and when you get more people in the room, it shares the labor load, so it's more relaxed," says Grove. "You're comparing ideas and sharing experiences." The collaborative brews (see the full list below) will be released at a May 12 party at No-Li Brewhouse and also will be featured at other release parties throughout the week. They're just part of the festivities surrounding SCBW, which coincides with American Craft Beer Week, celebrated somewhat unofficially throughout Spokane over the past few years. It took hold this year thanks to the growth of the Inland Northwest Craft Brewers Association, which includes breweries from North Idaho, rural Washington and the Palouse, in addition to the Spokane area. The group has grown exponentially in the past couple of years, along with the region's craft beer industry. Part of that growth and success, Hanson says, is the nature of the region itself. A session IPA with lavender, Amarillo and Cascade hops. Spokane's Iron Goat and Pullman's Paradise Creek put together five of their sour beers to create this monster. This Belgian golden strong ale, flavored with oranges and lavender, has an ABV of 8.2 percent. A single-malt and single-hop bock. A fruit-forward, German-style ale, flavored post-fermentation with coriander and sea salt. No-Li Brewhouse isn't part of the collaboration list, but that's not because the oldest brewery in Spokane doesn't play well with others. The godfather of Spokane's new wave of brewing is getting in on Spokane Craft Beer Week with the release of their OYSTER STOUT. They collaborated with Taylor Shellfish Farms in Shelton to create what head brewer Damon Scott calls a salty-meets-sweet treat. "It's in the realm of a chocolate stout, but the oysters we added to the boil give it a briny, salty feel, too," says Scott.